Use the full kitchens or gas grills to entertain family and friends. 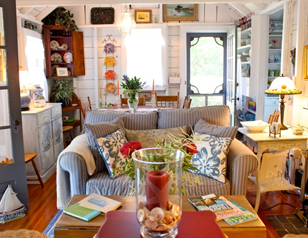 Three cottages to choose from for a romantic getaway or a large family vacation. HDTVs, board games, DVDs and free wireless internet for that rainy day. Outdoor activities such as ocean kayaking, bike riding and diving off of cliffs into quarries. If you are looking to get the most out of your summer vacation rental North Shore MA is the place to be. Located on the Massachusetts coast, Rockport Cottages gives you access to a perfect mix of modern luxury and outdoor adventure. From boutique shops to gorgeous beaches, everything you could want in a seaside vacation is right here. All of the Cottages at Rockport are ready for the summer, and air conditioning systems keep them comfortable at all times. The kitchens are equipped with state-of-the-art appliances, and gas grills give you the additional option of cooking outdoors. Entertainment options include HDTVs with cable, board games and DVDs, and free wireless internet. In addition to these features, each of the three cottages has its own unique charm. The Cottage on the Pond is located at the end of a secluded pathway, and guests can enjoy peaceful evenings on the screened-in porch or in the spacious back yard. With its three large bedrooms and downstairs living area, the Cottage on the Lane has plenty of space for large families. The Sound House is the coziest of the three, and guests are guaranteed to fall in love with its antique style. All of our cottages are pet friendly, and dogs and cats are always welcome. You and your family can also hop on some of our bikes to scout for swimming quarries and scenic lookouts. Many of these swimming quarries are surrounded by high cliffs, and adventurous visitors will have a blast diving off of them. Of course, there are plenty of things to do in the town of Rockport. You can walk to one of the community's numerous art galleries or visit Bearskin Neck, a popular shopping destination. The cuisine is one of the best parts of Rockport, and the local seafood is as fresh as it is delicious. If you are interested in renting one of our cottages or have any questions, contact us at (978) 290-4022.